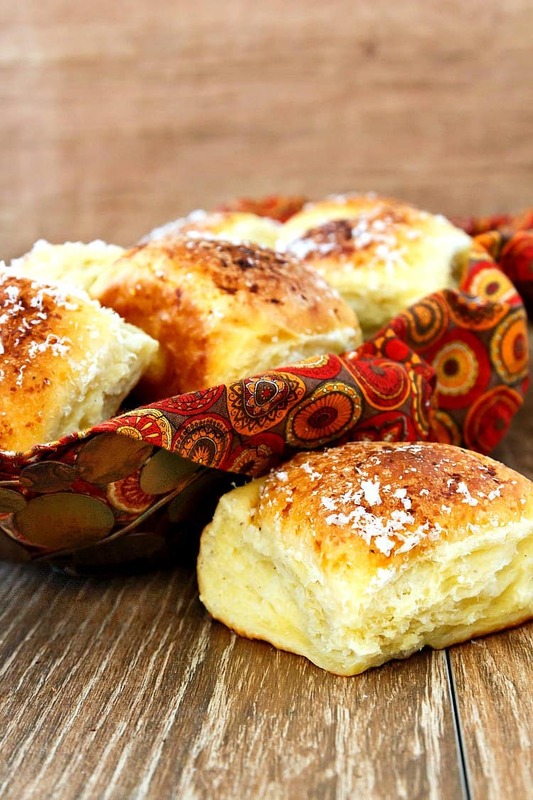 These dinner rolls are perfect for Thanksgiving. Subtle Parmesan and garlic flavor enhances these rolls without overpowering the other parts of the meal. 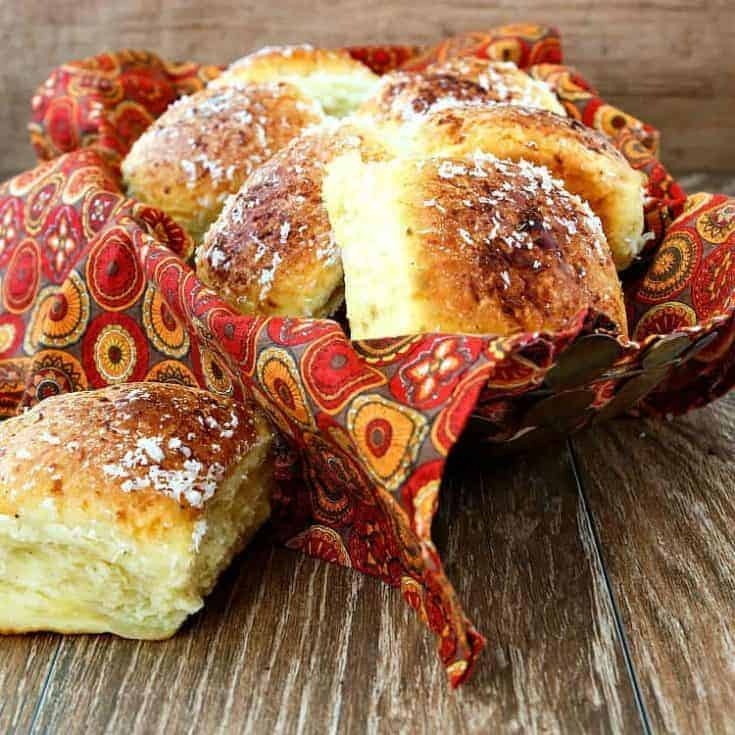 I am proud to partner with the Idaho® Potato Commission to bring you this recipe for The Best Rolls for Thanksgiving, also known as Garlic Parmesan Pull Apart Rolls. 3 Are Dinner Rolls Hard To Make? 4 Is There Any Way I Can Mess Up This Dinner Roll Recipe? 5 How Long Does It Take To Make Dinner Rolls? 6 How Can My Husband Help? Or How Can I Keep Him Out of the Way? There is plenty of information out there on the Hinternets describing the nutritional benefits of potatoes. They’re low in fat, you get over half your Vitamin C from just one medium potato. Half! And a third of your Vitamin B6. There’s more, too. Here’s a whole brochure, Potatoes: Goodness Unearthed from the United States Potato Board, that outlines the nutritional value of potatoes. 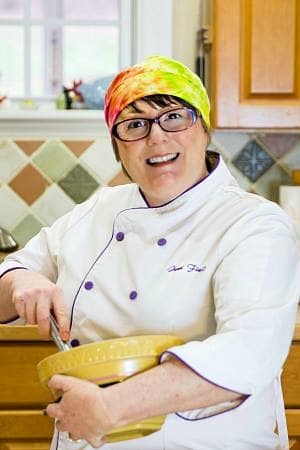 The more I work with my friends at the Idaho® Potato Commission to find new and delicious ways to add potatoes to baked goods, the more I want to focus on what potatoes have to offer in the baking and keeping departments. Because of the potato’s high starch content, yeast loves it. I can practically hear the yeasties salivating as I tip them into their dinner bowl full of complex carbohydrates they can happily break down into sugar and alcohol, all the while merrily burbling out carbon dioxide. And with so many yeasties eating so much delicious food and, um outgassing, so much carbon dioxide, dough made with potatoes or even just the water from cooking potatoes rises relatively quickly to dazzling heights. Potatoes also have the most desirable ability to keep breads soft and fresh for several days. How do they work this magic? When you cook a starchy Idaho potato such as a russet, all the starch granules swell up with moisture like little sponges. That’s called gelatinization. In this instance, gelatinization has nothing to do with actual gelatin and everything to do with the way starches behave when heated. And the cool thing about gelatinization is that, unlike sponges that dry back out, starch granules hold onto their moisture for days. And it is this ability to hold onto moisture that keeps breads baked with potatoes so soft and fresh for a relatively long period of time. It seems like magic, but it’s just delicious science. If you’d like to read further about how gelatinizing starches before baking helps keep bread soft, springy, and fresh, read my post on the Tangzhong Method. 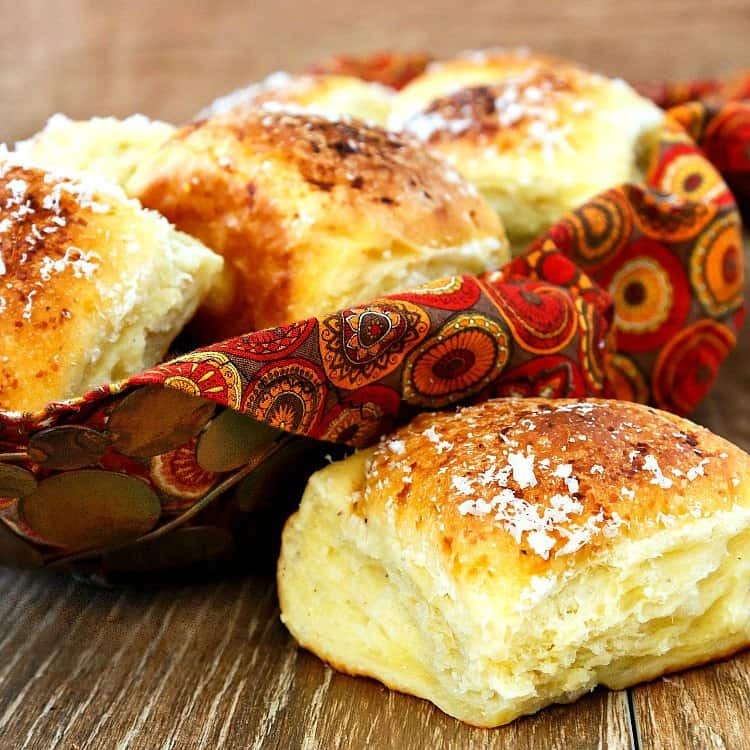 Otherwise, let’s get on with making the best dinner rolls you may ever have, which in general means potato rolls and in this particular instance means Garlic Parmesan Pull Apart Rolls. Lord. Are Dinner Rolls Hard To Make? Can you boil a potato? 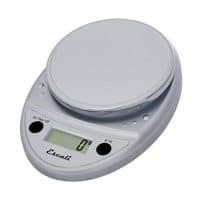 Do you have a kitchen scale and a stand mixer? Then you can make these rolls. Seriously, friends. The recipe is a matter of boiling potatoes and drying them out on the stove for just a bit, and then mixing them together with the other ingredients. The recipe even tells you what order to add everything. I do recommend using a stand mixer for these rolls. The soft dough needs a good 10 minutes of machine kneading, and that translates into maybe 20 minutes–at least–of hand kneading. Also, for consistency’s sake as well as ease of measuring, I list all my ingredients by weight (except for teaspoons or tablespoons), so to succeed with my recipes and to standardize your own recipes, a scale is pretty necessary. Is There Any Way I Can Mess Up This Dinner Roll Recipe? The biggest thing that can happen is that you use a pan that is too small for the amount of dough you have. And then what happens is that the rolls will mushroom over the top of the pan a bit and just sort of look crowded and funny. They will still taste great, and when pulled apart, you’ll have skinny, tall, soft, fragrant rolls. If you don’t mind some odd-shaped rolls and are good with calling them “rustic,” you can bake them in a 10″ round pan. 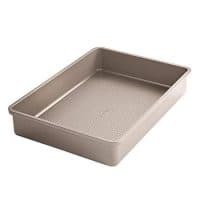 If you prefer squared off, more regularly shaped rolls like the ones in these photos, bake in a straight-sided 9 x 13-inch baking pan. You can also run the risk of underbaking your rolls. Since they’re full of potatoes and oil, they’re not going to give you a “hollow thumping sound” so you’ll know they’re done. Do what I do and rely on an instant read thermometer. You’re looking for a temperature of 195-200F. How Long Does It Take To Make Dinner Rolls? About 15 minutes to boil the potatoes and 5 minutes to dry them out. During that time, you can get out and weigh the rest of your ingredients. Then it’ll take a minute to put everything together, 11-12 minutes of mixing/kneading, about an hour or so of rising. Then you’ll scale and shape the rolls, let them rise again for 30-40 minutes and bake. What is that total? Maybe 2 hours, start to finish. Note though that you can refrigerate the dough overnight for the first rise or shape the rolls and refrigerate them overnight for the second rise. The schedule is up to you. Be the boss of yeast and, if the timing isn’t working out for you, put it to sleep by refrigerating it. It’ll work way more slowly in the fridge and then perk back up once it warms back up. Nice! I buy my yeast in bulk, and it just lives in the fridge until I need it. How Can My Husband Help? Or How Can I Keep Him Out of the Way? Unless you are working in a commercial bakery, making this dinner roll recipe should be a solitary, zen-like activity. So no, he can’t really help. Tell him I said so. If you’re pushed for time or just make something together in the kitchen, he can help you shape the rolls. Maybe you can keep him out of the way by having him set up your proofing box. You don’t technically need a proofing box, but this one does fold up so you can store it. And it will give him something to do, so there’s that. Okay, now we’re ready. If you have any other questions about making these Thanksgiving dinner rolls, please email me and I will help you out. I know you have a burning question: Are these really the best rolls for Thanksgiving? Yes. Yes, they are. The Beloved and I have been plowing through them like it’s our job, and I can’t wait to make these again and again. And yes, to serve them at our Thanksgiving dinner. Enjoy! 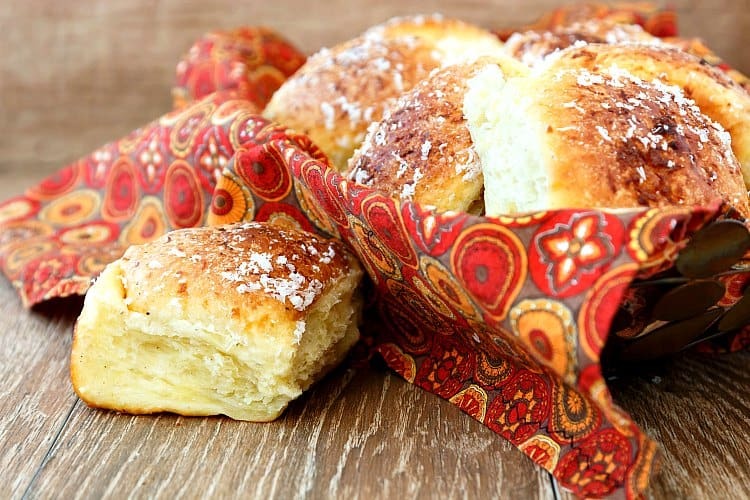 hese soft and flavorful rolls will make you hungry the moment you smell them in the oven. The combination of fresh Parmesan cheese and garlic is a winner to begin with, but add them to a supple, pillowy dough made with Idaho® russet potatoes, and I guarantee you will end up with the best possible rolls to serve at your Thanksgiving dinner! Wash, peel, and cut the potato into 1" pieces. Place in a saucepan in lightly salted water, and bring to a boil. Reduce the heat to a simmer and cook for about 15 minutes or until potato pieces are easily pierced with a knife. Drain, cover, and return to low heat for 5 minutes to dry a bit. Measure out 6 oz of cooked potato and place in the bowl of your stand mixer. Add the oil, sugar, garlic paste, salt, and pepper. Fit your mixer with the paddle attachment and mix on medium low speed until the potato mixture is smooth. Add the milk, egg, half the Parmesan cheese, flour and yeast, in that order. 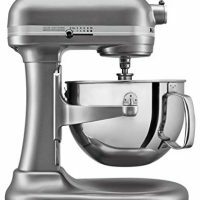 Fit your mixer with the dough hook, and mix on low speed until the flour is evenly moistened and the dough is starting to come together, about 2 minutes..
Knead on medium speed for about 10 minutes, until the dough is smooth, shiny, stretchy and clears the sides of the mixer bowl. The dough is soft, so some will stick in the bottom of the bowl. That’s just fine. Scrape the dough into a rough ball in the mixer bowl, spray with a bit of oil or pan spray, and set aside in a warm place to rise until double. Since yeast loves potatoes so much, this will only take about an hour or so. 10. Scrape the risen dough out onto a lightly oiled surface and press out the gases. 11. Sprinkle the other half of the Parmesan over the dough and then knead it in. You do not have to be very thorough because we want some pockets and ribbons of cheese running through the dough. Just knead until the cheese is incorporated. 12. Divide the dough into 12 or 24 even pieces. If you have a scale, weigh the entire amount of dough and then divide that weight by the number of rolls you want. Now you have a weight for portioning. I scaled 12 large rolls at just over 3 oz each. 13. Stretch each portion of dough to find a smooth side and then tuck the rest of the dough under to form a smooth ball. Tighten up the ball by rolling it between your palms on your work surface. 14. In a 9” x 13” nonstick pan, evenly space the rolls in 3 rows of 4 for large rolls or 4 rows of 6 for small ones. Melt the butter, garlic, and salt (if using) in the microwave. Spread the tops of the rolls liberally with half the mixture. Cover the rolls with plastic wrap and let rise in a warm place until almost double, about 30-40 minutes. Pour or brush the rest of the butter mixture evenly over the rolls and then place in the oven. Bake for about 25 minutes for large rolls and 20 minutes for small rolls. Rotate the pan if browning unevenly. The rolls are done when the internal temperature reaches 195-200F. They will be deeply golden brown on top and golden brown on the sides. If the rolls seem to brown too quickly, tent loosely with foil. As soon as you take the rolls out of the oven, grate on a bit more Parmesan cheese. Allow the rolls to cool in the pan for 15 minutes. Then carefully ease them out onto a cooling rack to cool completely. Wrap loosely in foil and reheat to serve. They’re great cold, too, but you will really love them warm. Enjoy! Use Parmesan Reggiano or an American hard cheese such as Grana for this. Parmesan in a can will not give you the same flavor, texture or aroma as fresh. Note: You can make these rolls without doing the refrigeration process. When shaping the dough, make sure your hands are well-oiled so the dough doesn't stick to you. The stated time of 70 minutes does not take into account rising time. Enjoy these dinner rolls, y’all. Your kitchen will smell so good when you make them–it’s hard to beat the garlic Parmesan combo! Enjoy the best rolls for Thanksgiving. 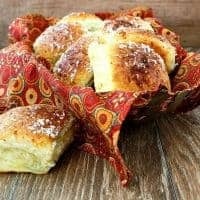 If you’re anything like me and The Beloved, you’ll want to make Garlic Parmesan Pull Apart Rolls all year long. They truly are soft and full of flavor. Plus, they’ll make your house smell amazing while they’re baking! Thanks again to the Idaho® Potato Commission for sponsoring this post. And thank you guys for supporting the brands with whom I work. I live t 7200 feet and am wondering/hoping that this recipe will work at my altitude. Any ideas/recommendations? That is an excellent question. I do not know, but I will check with my high altitude baker friends and email you directly, Steven. I’m making them today (Thanksgiving), so I will most likely be the first to let you know. I plan to increase temp, decrease time, increase flour and milk and decrease yeast consistent with the recommendations of Susan Purdy (“Pie In The Sky” high altitude cookbook, which is my go-to reference nowadays). I really hope they turned out for you, Steven. And I really need to remember to write on every recipe that all measurements, unless otherwise specified–even liquid–is by weight. Happy Thanksgiving! It will be too late for me this time, but when you say “6 oz” of cooked potato do you mean weight or volume measurement? I’m assuming weight . . . Yes, weight, Steven. I hope they worked out! Was going to make these for Thanksgiving last year but opted for my tried and true dinner roll. This year I’d like to make these ahead and freeze. Would you recommend? Hey, Sharon! Yes, these freeze well. Just cool them completely, wrap in plastic wrap and then put in freezer bags (or wrap in foil). Let them come to room temp, still wrapped, and then warm to serve. Enjoy!